The Magic's first -- and only -- NBA Finals victory came against the Lakers on June 9, 2009. From the moment of their inception, the Orlando Magic had a built-in rivalry with the Los Angeles Lakers. When the NBA announced on April 22, 1987 that its Board of Governors granted an expansion franchise to Orlando, Magic Johnson was a week away from starting the Lakers on a playoff run which would result in the fourth of his five championships as their point guard and driving force. Aside from the Johnson connection in name only, the presences of Disney World and Disneyland were hard to resist, even if both theme parks are located outside each respective city. And the defection of two high-profile centers to the Lakers — one by free agency, the other by a four-way trade — after they helped the Magic reach the NBA Finals in 1995 and 2009 ratcheted up the intensity in Orlando. Both teams will go into Friday night’s matchup — the 49th in regular-season play in a series which the Lakers lead 33-15 — apparently bound for an encounter several months from now in the draft lottery. The only time the Magic and Lakers failed to qualify for the playoffs in the same year was 2005, when the Magic ended up taking the never-to-be-seen-from Fran Vazquez and the Lakers chose the enigmatic Andrew Bynum. Sure, the Miami Heat are much closer geographically and also play in the same division as the Magic. But they’ve met the Magic in postseason play once, the same number of times the Lakers have. Dwight Howard’s first game in Orlando as a visiting player was noteworthy for two things — a whole lot of trash-talking in his direction by the injured Glen Davis from the Magic bench, and a whole lot of free throws. After years of seeing Howard deliberately fouled by other teams, Magic fans got to see coach Jacque Vaughn try employing the same strategy. Unfortunately for Vaughn and anyone else connected with a team which went into the game with an 18-46 record, Howard rendered that tactic ineffective by making 25 of his 39 attempts. The Magic committed 35 fouls, two shy of the franchise record, although Maurice Harkless was their only player with four than four. The Magic’s most lopsided win in series history was supposed to have marked the first game for Shaquille O’Neal in Orlando since he signed with the Lakers the previous summer. Much to the dismay of NBC, which made sure the game was scheduled for a Sunday afternoon, Shaq was injured and not even in the Orlando Arena. Without him, the Lakers saw the Magic bolt to a 31-14 lead after one quarter. Helped by five 3-point field goals from Nick Anderson and three from Dennis Scott, the Magic kept pouring it on. The victory improved the Magic’s record to 15-4 under interim coach Richie Adubato. They would make the playoffs as the No. 7 seed in the Eastern Conference and lose in five games to the Heat. Arron Afflalo, who came to Orlando as part of the trade that August which sent Howard to Los Angeles, stole the spotlight as the Magic beat the Lakers on the road for only the fifth time. The Los Angeles native finished with 30 points, two off his career high at the time, as the Magic shot 50 percent and outscored the Lakers 40-26 in the fourth quarter. Davis contributed 23 points and 12 rebounds less than three weeks before his season and that of the Magic both took a turn for the worse when he sprained his left shoulder. Nikola Vucevic added 17 points and 12 rebounds while playing Howard (21 points, 15 rebounds, but no blocks) to a virtual deadlock, and Jameer Nelson scored 19 points and dished out 13 assists. 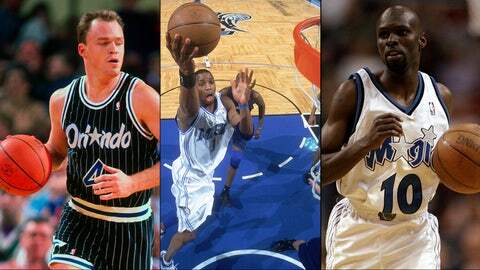 Ken Hornack breaks down the Top 10 Orlando Magic records that are sure to endure. A 20-year-old Kobe Bryant sparked an incredible turnaround by the Lakers, who trailed the Magic by 24 points late in the second quarter. All but six of Bryant’s 38 points came in the second half, when the Lakers made 27 of their 35 shots. "We all knew how good he was. But this is a coming-out party," Magic coach Chuck Daly said afterward. Derek Harper, who was a member of the Magic the previous season, and Glen Rice knocked down key 3-pointers in the closing minutes of a game where O’Neal’s 31 points and 13 rebounds were almost relegated to an afterthought. Leading the Magic in scoring was not Anderson, Penny Hardaway or Horace Grant but rookie center Michael Doleac, who had 25 points off the bench in 32 minutes. The Magic’s 40-game regular-season home winning streak came to an ignominious end as many fans began heading for the exits with more than five minutes remaining and the Lakers up 106-80. Grant did not play because of back spasms, but even if he was available and healthy, it wouldn’t have changed the outcome against a team sparked by Johnson’s return to the court in January. Johnson finished with 14 points in 36 minutes in his first game in Orlando since being the MVP of the 1992 All-Star Game. O’Neal had 23 points and 10 rebounds in what wound up being his last contest against the Lakers as a member of the Magic, who had not lost at home — excluding the playoffs — since falling to the Utah Jazz the previous March. After being blown out by 25 points in Game 1, the Magic played more like the team which stunned LeBron James and the Cleveland Cavaliers in the conference finals. But the game remains known for the stunning conclusion to regulation rather than anything which took place in the extra five-minute period. Hedo Turkoglu threw a perfect lob pass off an inbound pass with less than a second to go to Courtney Lee, who had sprung free after Bryant ran into a pick near the free-throw line. But the Magic rookie missed the shot, and the Lakers took advantage of the reprieve to grab a 2-0 series lead. "We missed it. I don’t know what else to say," coach Stan Van Gundy said. The loss overshadowed a 34-point performance by Rashard Lewis. There would be no repeat of the sweep the Magic suffered in 1995 at the hands of Hakeem Olajuwon, Clyde Drexler and the Houston Rockets. The Magic made sure of that by shooting 62.5 percent, an NBA Finals record, highlighted by a 24-of-32 first half. But even with Bryant going only 4 of 15 after the first quarter, the Lakers kept it close. They tied the score at 99 until a dunk by Mickael Pietrus and a jumper by Lewis gave the Magic some breathing room. Point guard Rafer Alston, who was acquired in February from the Rockets after Nelson had torn his right labrum, had a team-high 20 points after making only three field goals the previous two games. The Lakers got 23 points from Pau Gasol but missed 10 of their 26 free throws. Fans of the San Antonio Spurs who watched this game could relate to the agony which the Magic had to go through. Derek Fisher, who earned a spot in NBA lore in the 2004 Western Conference finals with a game-winning shot against the Spurs, connected from 3-point range with 4.6 seconds to go in regulation and again in the final minute of overtime. The Magic held an 87-84 lead and had a chance to tie the series, but Howard missed two free throws with 11.1 seconds remaining in the fourth quarter. Fisher came downcourt and wasted little time in pulling up and firing over Nelson for the basket from which the Magic and their fans never recovered. Three nights later, the Lakers wrapped up their 15th title with a 99-86 victory. In their first two months of play, the Magic had already recorded several attention-getting victories — downing the defending champion Detroit Pistons to begin the preseason, stunning Patrick Ewing and the New York Knicks, erasing a 25-point deficit to win in overtime at Cleveland. But being able to topple Johnson and the Lakers in their first visit to Orlando must have sent shock waves around the league. Sam Vincent, who came to Michigan State not longer after Johnson led the Spartans to the 1979 NCAA championship, finished with 21 points and 10 assists. 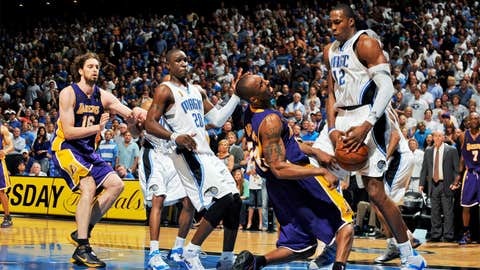 He was at his best during a fourth quarter in which the Magic outscored the Lakers 35-18. Terry Catledge — that’s the Cat Man to anyone who was around 25 years ago — topped the Magic with 26 points and 12 rebounds. More than 18 months worth of fan resentment and animosity toward O’Neal, who seemed to take great delight in playing the role of villain, came pouring out two-thirds of the way through a season where the Magic were beset by a rash of injuries and failed to make the playoffs. And of the franchise-record 692 regular-season games played by Anderson, this one stands out the most. He punctuated a performance in which he finished with 30 points by hitting an eventual game-winning 3-pointer with 7.1 seconds to go. Bo Outlaw, who will be honored at Friday night’s game, played all 48 minutes and grabbed 14 rebounds, four more than O’Neal. Daly used only eight players in the game, including Danny Schayes at center and reserves Derek Strong, Gerald Wilkins and Spud Webb.